Location: Howe St (Drake to Smithe), Smithe St (Howe to Granville), Granville St (Smithe to Davie), Downtown Vancouver. Join the Parade as individual Cosplayer, group, business or non-profit. Walk on the parade and transform yourself on the World's Largest Cosplay Stage. For businesses to promote their brands. Real-life event exprience leaves much stronger impression than plain advertisement does. For non-profit organizations to promote and advocate to the public. For dance schools or music bands to engage their students or members, and recruit from the public. For title sponsor, presenting sponsor or advertisers to present your brand at the front of 100,000+ spectators. We deliver customized sponsorship package to achieve your goals. If you would like to perform on the stage during Halloween Expo, please apply. If you would like to run a panel or host an event during Halloween Expo, please apply. Apply for indoor spaces for vendor, exhibitor and artist alley, and street parking space for food trucks. For title sponsor, presenting sponsor or advertisers to present your brand at the front of 100,000+ spectators on site and 1,360,000+ visitors online. We deliver customized sponsorship package to achieve your goals. Each year, about 1000 volunteers are involved in planning and organizing Vancouver Halloween Parade and Expo. Join our team with your friends and make new friends while having fantastic time. For media inquiry, photo and video from past years, please explore our gallery. 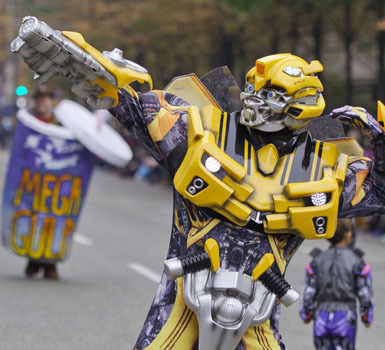 The 6th annual Vancouver Halloween Parade & Expo is a three day festival inspired by comics, anime, video games and mythologies. With the Parade starts at 11 AM Sunday Oct 13 in downtown Vancouver, welcome to the world's largest Cosplay stage (this is a family friendly festival so blood or gore costumes are NOT allowed).